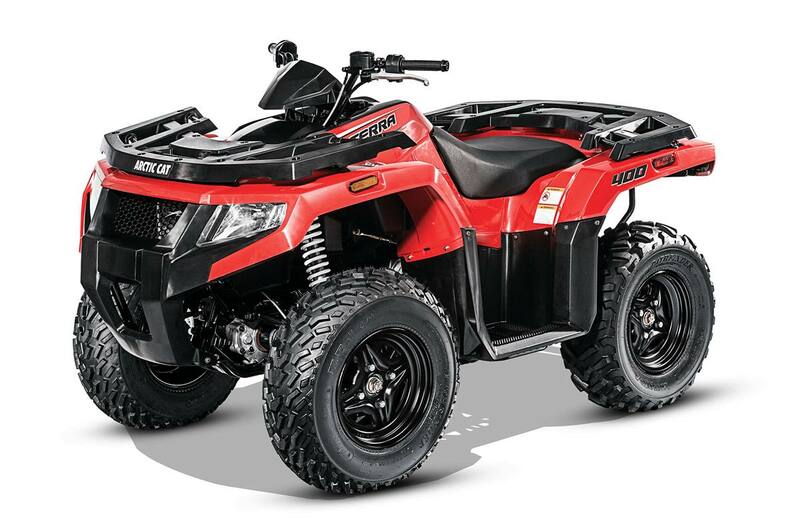 Ride-In Suspension: This mid-sized machine provides big performance with 10 inches of ground clearance and seven inches of suspension travel. Trail bumps are what this machine eats for breakfast, lunch or dinner. 400 H1 4-Stroke Engine: There’s nothing mid-sized about this single-cylinder, air/oil-cooled, 366cc 4-stroke engine. The combination of this mighty motor and the 400 chassis will bring an instant smile to your face. Digital Gauge: The digital gauge features large critical operation information indicators: clock/hour meter, fuel level, mode button, set/reset button, odometer/trip, gear position, speedometer/tachometer, differential lock, high beam, temperature and oil pressure. On-the-Fly 2WD/4WD: Arctic riders prefer to be in control with their on-the-fly 2WD/4WD. Go from 2WD to 4WD with a flick of a switch. Front and Rear Impact-Resistant Racks: Strong and durable. These impact-resistant racks are rated for 75 lbs. carrying capacity on the front and 150 lbs. on the rear.